In his autobiography, "My Life In America And What Maria Callas Taught Me," Mr. Lampas reflects back upon his life, career and performances and recalls how happily fate brought him in contact with Maria Callas, culminating in a relationship that combined both music and friendship. His special relationship with Maria Callas and the encouragement she gave him to pursue his career is recounted faithfully. His participation in her Master Class at Juilliard was a bonus which neither party anticipated. After arriving in America and blessed with a talent as yet undeveloped, Marko Lampas was drawn to an operatic career. In his autobiography, "My Life In America And What Maria Callas Taught Me," he reflects back upon his life, career and performances and recalls how happily fate brought him in contact with Maria Callas, culminating in a relationship that combined both music and friendship. From his humble upbringing in Greece to his arrival in America, Mr. Lampas details the ups and downs, the successes and pitfalls, the loves gained and lost, which he experienced in fulfilling his dream. Charming anecdotes fill this memoir, such as his encounter with John Cassavetes in pursuit of an acting career. This brief meeting happily led not to an acting career but to the commencement of his musical studies, resulting in two fulfilling careers: first as an operatic tenor and then as a practicing voice teacher. Mr. Lampas, through his own experiences, shares the hazards and strains of a career in the performing arts and offers advice and counsel to singers who may encounter similar issues in striving for success. He also discusses the balance required to juggle one's performing and private lives as well as the diversions that can impede singers from attaining their goals. 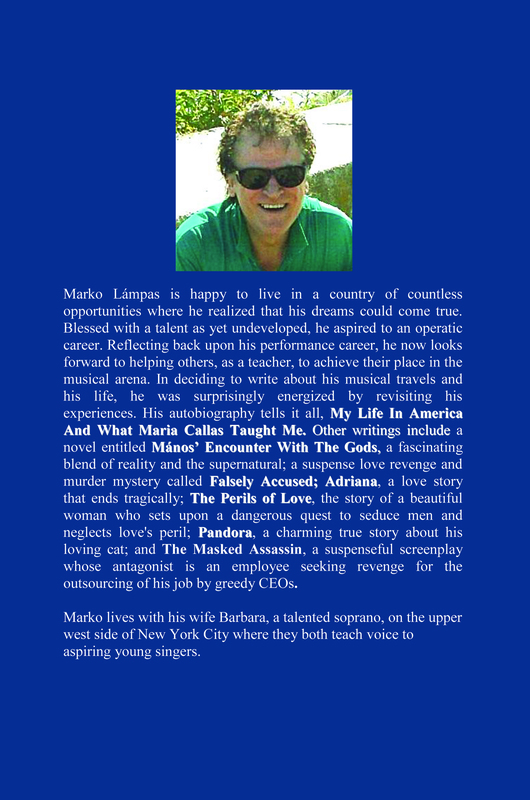 "My Life In America And What Maria Callas Taught Me" is available for purchase on amazon.com and barnesandnoble.com. It can also be purchased or downloaded on lulu.com. Marko Lampas appears on Facebook; on his website http://www.millerlampas.com; and on YouTube at http://www.youtube.com/user/HeraklioneArts.